We're back with the addition of 11 Marvel Comics from May 1963, including the first issue of Sgt. Fury! 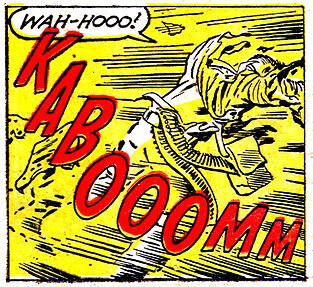 These books add 118 sound effects, bringing the total to a nice round 2,222 from 244 comics. (There were no sound effects in Love Romances #105). I'm planning to moderately increase the number of updates over the next six months. Stay tuned! Another complete month from the Marvel Silver Age is done with April 1963! 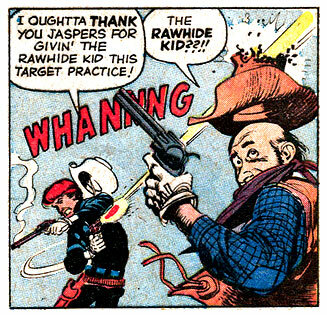 There are 62 new sound effects from the 10 comics this month -- including some rare comics work by the legendary Jack Davis on Rawhide Kid -- bringing our total to 2,105 sound effects from 233 comics. Did you know this website also has a Tumblr blog? It does! It's similar to the other social media posts detailed in the last update, combining the site's contents with cool new sound effects from the current week's new comics. Check it out! Welcome to those of you who have discovered the site through my new social media push! And for the rest of you, in addition to the old comics found on the site, I've started adding 18-20 of the niftiest effects from the current week's new comics on Twitter, Instagram and Facebook. Check it out! 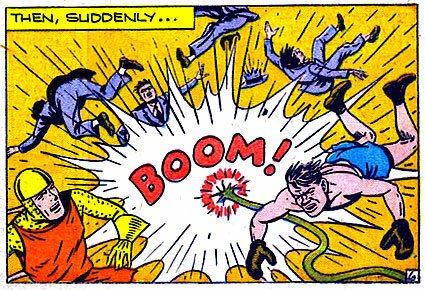 As for the site itself, I'm still slowly plugging away, and I've added 248 new sound effects from nine issues of Adventure Comics from 1946. These pick up the Superboy, Aquaman, Johnny Quick, Green Arrow and Shining Knight strips that moved from More Fun Comics, which I previously posted. Next it's back to Marvel 1963!